Notes: "This is actually a picture from a year ago that I took because it was legitimately one of the worst things I had ever been served. I'm not sure what it was supposed to be, but it ended up as a ball of rice packed so absurdly tight that no grains were discernible and the sauce (which was awful and sweet) couldn't get through. The main entree also had mushrooms and some sort of chicken product on it. 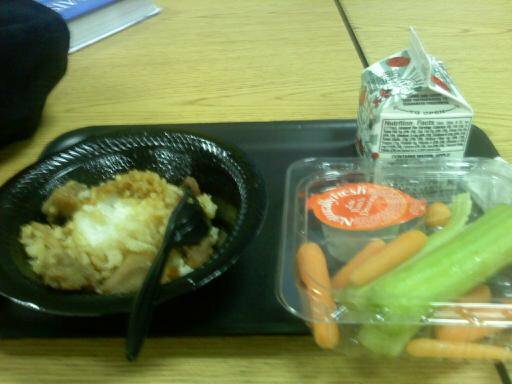 It was served with celery and carrots with low-fat ranch dressing and apple juice from concentrate."